I would also like to inform you that most of us here at Help2Go support forums offer our expert assistance out of the goodness of our hearts. [b][i]Please be courteous and appreciative for the assistance provided! The cleaning process is not instant. Combofix, OTL and hijackthis logs can take some time to research, Please be aware that I am a volunteer here with a job and family so I ask that you be patient when waiting for replies. I use Google as resource to research what the problem is just to understand some of the infections that are infecting the computer and understand where I need to focus more on to ensure that the member get the best and honest service. OK..If you have a Vista or Win7 computer ensure that you right click on the tools and run them as an Admin. IF XP double click on the program to run them. Choose the language and hit Enter key, then choose Option 2 (Fix) and hit Enter key again. The S&D Toolbar report log. error: Read A device attached to the system is not functioning. Going over your logs I noticed that you have a lot of cracks on your computer. Avoid gaming sites, pirated software, cracking tools, keygens, and peer-to-peer (P2P) file sharing programs. They are a security risk which can make your computer susceptible to a smörgåsbord of malware infections, remote attacks, exposure of personal information, and identity theft. Many malicious worms and Trojans spread across P2P file sharing networks, gaming and underground sites. Users visiting such pages may see innocuous-looking banner ads containing code which can trigger pop-up ads and malicious Flash ads that install viruses, Trojans and spyware. Ads are a target for hackers because they offer a stealthy way to distribute malware to a wide range of Internet users. The best way to reduce the risk of infection is to avoid these types of web sites and not use any P2P applications. It is pretty much certain that if you continue to use P2P programs and warez-sites, you will get infected again. Click on: Tools > then in "Internet Options" > Click on the "Advanced" Tab > You will see the "Reset" button at the bottom. <-- Click on it to reset internet explorer so you can use it again. *If The infection may created a Proxy with your internet connection. We will need to reset that. - In Internet Explorer browser: Tools Menu -> Internet Options -> Connections Tab ->Lan Settings > uncheck "use a proxy server" or reconfigure the Proxy server again in case you have set it previously. - In Firefox Browser: Click in Tools Menu -> Options... -> Advanced Tab -> Network Tab -> "Settings" under Connection and uncheck the proxyserver. Reboot and check your internet connection. 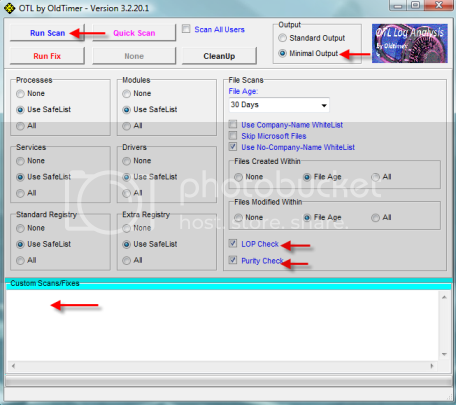 To work properly, you must install all of the fixing tools on the Desktop..
right click on the link and select 'Save Link/Target As'. Now copy the lines in bold below. right click in the Custom Scans/Fixes window (under the blue bar) and choose Paste. Click the Run Scan button. Do not change any settings unless otherwise told to do so. The scan wont take long. Please copy (Edit->Select All, Edit->Copy) the contents of these files, one at a time, and post them with your next reply.